None of these are bad games and I would play them all again. I’m just trying to downsize my collection a bit and don’t mind trading all these for something else. Verräter. German edition with the Fairplay logo (1999). The game is in German. It includes some English player aids I printed off. The full translated rules are available on BGG. Tuckbox shows some wear. Cards show no noticeable, significant wear. Isle of Trains. English second edition (2015). Very good condition. Box nor cards show any noticeable, significant wear. This version includes the updated, correct Clark contract card. Tuckbox shows significant wear. Cards are in great condition and show no noticeable, significant wear. 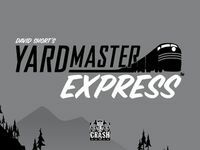 Yardmaster Express. English standard edition (2014). Very good condition overall. Nearly like-new. Box lid is bowing in a bit. Game board is pretty significantly warped, but still playable.